From A Left Wing: Starved fans pack Rose Bowl for pointless match - and love it! Starved fans pack Rose Bowl for pointless match - and love it! Last night's match between Chelsea & Inter Milan was a pretty laid back affair. Chelsea dominated the entire match, and seemed really relaxed as they did so. I'd say they were operating at about 65%. (Read match report here.) Inter Milan? I don't know what to make of them. They seemed to accept to their role as the team to be defeated by Chelsea. Which is a shame for their fans - there were quite a few in my section. The game between the Italian domestic champions and one of England's most star-studded teams looked like they drew about the same as a UCLA-Fresno State football game. it's clear soccer still has a way to go before it becomes a must-see event in Southern California. Only a spectacle, like the World Cup, proved to be a winning ticket. Somewhere around 80,000 people turned out to see Chelsea play at 65% percent, in a game that only matters to the deep soccer nerd aware of Drogba's vascillations in commitment, the rumors that it maybe might possibly be John Terry's last appearances as "Mr. Chelsea" (he is being seriously romanced by Manchester City), and that The Special One's team would be facing the squad that made him special. 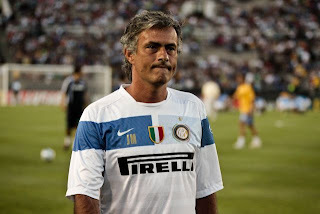 I'm speaking here of course of the elegant José Mourinho, former Chelsea manager now guiding Inter and pictured here, perhaps slightly bummed about the large numbers of people about to witness his team's mediocre performance. I am not surprised that there are tens of thousands of people who are that deep into this world. But many US sports writers are willfully oblivious to the amount of energy (and money) we spend keeping up with this sort of stuff, and what suffering we are willing to endure in order to participate in the global game. We brave the tail end of rush hour and overcome heat-wave induced inertia for the pleasure of watching a game played with the intensity of a weekend kickabout between friends. We do so because the people on the field are some of the most technically skilled and gifted players of the sport. I was just happy to lay eyes on Petr Čech (goalie of magic hands & bionic face) and admire John Terry (who manages to be an intimidating defender when he's just standing there and the ball is nowhere near him). And I am not a fan of either team. the largest crowd to see a soccer game in Southern California since the U.S. defeated China in the 1999 Women's World Cup final, also at the Rose Bowl, and the biggest for men's soccer since the 1984 Olympics. Last night's crowd is, in fact, good evidence of how hungry fútbol fans are for more. We live on meager rations. 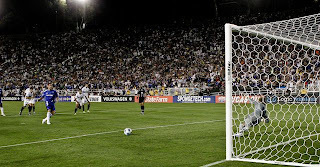 The MLS bores the crap out of most of us. The WPS season is all too short. You have to have a really expensive cable package if you want easy access to international games. And our sports editors are actively hostile to us - reproducing match reports written by team press offices, or reported with all the literary flare of the phone book. Good stories are ignored until they are irrelevant. When you look at the numbers the story isn't that of a city that doesn't care about the sport - quite the opposite. Perhaps Wolf got the story wrong - as so many US sports journalists do - because the people behind those numbers are invisible? After yesterday's interview with Gustavo Arellano, I hung out to listen to his conversation with musician Ceci Bastida. Ceci was a member of the influential Tijuana No!, and is a fantastic musician and advocate for Rock en Español. She and Arellano talked about the music industry's resistance to marketing Mexican music - to Spanish-language music in general (even as, say Japanese or French Pop is embraced by alternative-middlebrow radio), and Mexican music in particular. Such resistance makes no sense in terms of money and demographics - it's a blindness to the interests and desires of not only Latino consumers but also others who care about, are participants in, and members of Latino, Chicano, and/or Mexican cultural spaces. Of course, the 80,000 people at the Rose bowl were not 100% Latino. Just for the sake of argument, let's say the breakdown was an uncharacteristically-low-for-L.A. 60%. I think that's about the fraction of the crowd that Wolf missed. But where Anglo/American/European sports writers and editors are content to treat this crowd as invisible and insignificant, it's worth taking note of those organizations that are very interested in taking note of every person who passes through the turnstiles - Chelsea FC & FC Internazionale Milano. You can bet they are crunching the numbers and know exactly how the math on this works. What a great rebuttal to that piece by Scott Wolf (and I mean "piece" in more than one sense there). I'm impressed by your patience and your tact in the face of such ridiculously blatant anti-soccer sentiment. It’s time to read a great new soccer comedy, entitled Classes Apart.